This story originally appeared in The Breeze and is written by Connor Murphy. Photo by Tanner Leslie. Ryan Parkhurst, a journalism professor at JMU, wishes he never had to meet Andy and Barbara Parker. 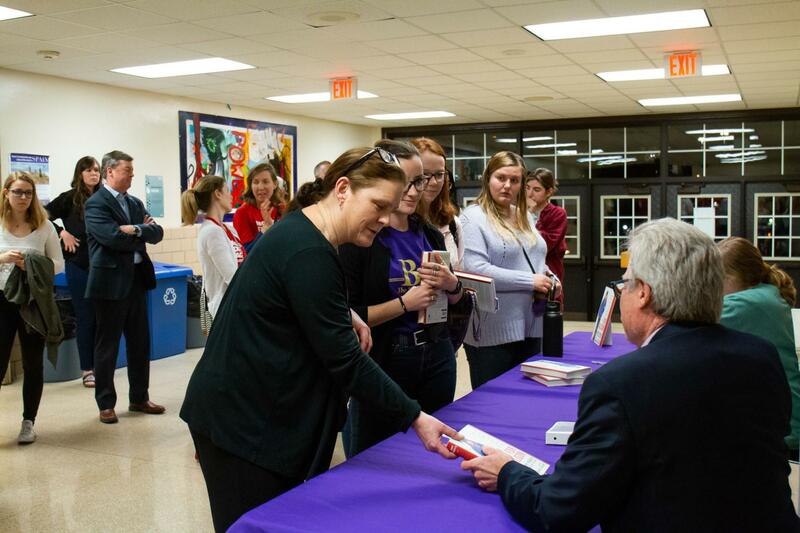 However, the two got in contact following Alison Parker’s murder on Aug. 26, 2015 in what Parkhurst would describe as a “really horrible and tragic time in their lives and in the life of the JMU community.” On Thursday night, Alison’s father, Andy Parker, visited JMU to speak about the writing process of his newly released book, “For Alison,” and to inform and remind the JMU community of Alison’s legacy. The event was organized by the Society of Professional Journalists at JMU. Parker described how approximately a month after Alison’s murder, he received a phone call from his friend, best-selling author and former reporter for the Roanoke Times Beth Macy. She encouraged Parker to write about his experience, despite Parker not initially seeing the story’s potential. Parker stated that people had already seen Alison’s murder and that he wasn’t sure he could “add any more to it.” Parker was then introduced to Macy’s agent in New York, who agreed Alison’s story was book worthy. Soon after, Parker shared his first chapter that told the account of Alison’s murder with Macy. She insisted that Parker try to publish his work, so Parker went “agent shopping” and narrowed his search down to six candidates. The book eventually sparked interested in Laurie Liss from Sterling Lord Literistic. Writing the book took over two years to complete. Parker explained how he was “religious” about writing between 500 to 1,000 words per day. “For Alison” was then marketed to various publishers. “For Alison” was later picked up by a start-up publishing company to speed up the process. Parker described his disdain at the idea of waiting for an offer from a larger publishing company that may never come. Nearing the end of the book’s publishing process, a photo had to be decided on for the book’s cover. The photo used was a surprise to Parker, as he had assumed the publishing company would have wanted to use the “iconic picture” of Alison in a red dress at WDBJ7’s news desk. However, a photo of Alison in the middle of a snowstorm before one of her reels was used in instead. The photo used was taken by Alison’s cameraman, Adam Ward, on the day of her appearance on CNN. Ward was also murdered moments after Parker on Aug. 26, 2015. Parker then explained how he hopes Alison will be remembered as more than a journalist who was murdered on television. The grief Parker experienced following Alison’s death was channeled into activism, as he aims to “turn tragedy into something constructive.” Since Alison’s death, he’s been advocating for stricter gun laws. Alison’s murder has allowed Parker to become friends with various politicians, such as Democratic U.S. Senator Tim Kaine. He also explained how others in the same field have worked against him “across the isle.” He cited a specific instance in which a Virginia State Senator tried to get a special prosecutor to investigate him for alleged threatening messages sent online. Despite attempts to silence Parker, he’s eager to share Alison’s story. Parker discussed his opinion on major gun violence prevention groups in his book, mulling over their pros and cons and analyzing their central messages. He also explained how Alison’s murder is different from other shootings such as those at Sandy Hook and Virginia Tech, due to the fact that Alison’s murder was captured on video. Videos of Alison’s murder can be found online, but Parker has worked for over a year to get them removed. Parker explained how with the help of the Georgetown University Civil Rights Law Clinic, he’s actively taking action against Google to remove videos of Alison’s murder. Parker explained how he hopes that in the future stricter gun laws, such as universal background checks and the elimination of the gun show loophole will play a part in maintaining a safer society in honor of Alison’s life.